Sculpt and define your face with this highlight and contour palette. Each set features 3 shades for defining, bronzing and highlighting. 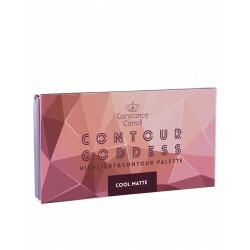 The powders make it easy to contour with pigmented, blendable, buildable colour. Each set includes an easy-to-follow application guide and a full-size mirror for convenience and quick on-the-go touch-ups. Contour like a PRO with this Contour Goddess Palette!